A common dilemma, how to occupy the family in this cold, bleak winter weather, get some exercise and stay healthy? 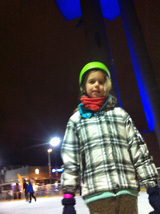 Due to our location we’ve found one answer - Ice Skating! My daughter was thrilled with the idea, my son less so and me, it was with some trepidation, I had not stepped on the ice for almost 30 years! Tower Park Praha is really making the most of their privately held land underneath the Žižkov Tower. With their Mini Golf course less enticing, they’ve lured in the crowds by installing a small ice rink (30x14metres) on the Miminoo Cafe lawn. The Ice Rink is expected to be open every day until the end of March. The people behind the ice rink used to run the rink in Ovocný trh, the Fruit market square in Prague 1 (behind Myselbek shopping centre) over the Christmas season. But after Prague 1 Council pulled it’s funding the operators needed to find somewhere else to set up. What is Prague 1’s loss has become Prague 3’s gain! Open from morning until late evening you have a range of times and at varying prices to experience the rink. Sessions run for 2 hours, you can turn up within a session, for instance we started skating at 9.30am a little later than the start time of 9.00am. They clean the ice every two hours so you’ll need to get off once the ice clearer enters. Depending on the time of day or who happens to be around you either pay at the outdoor bar right at the entrance to the Miminoo Cafe (on the left hand side) or you pay at the small wooden hut behind the cafe. The hut is where you can hire skates for 50czk per person or you can have your skates sharpened on the spot. I took my son and daughter on Saturday morning. 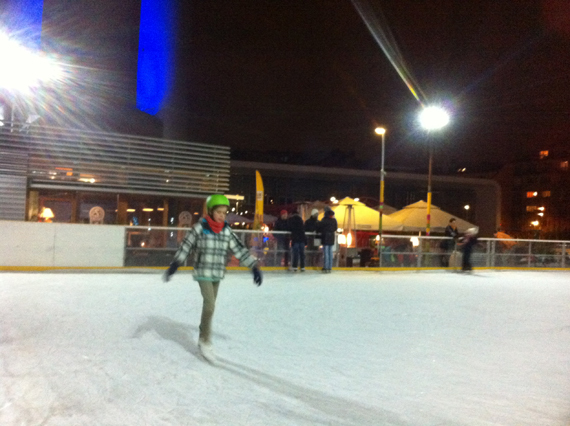 We paid 100czk each for the session although my son got to skate for free because he is under 125cm - fantastic! So in total we paid 200czk for entry and 150czk for 3 pairs of skates. On our next visit we went on a weekday evening, it was less busy than Saturday morning. Night skating is quite special the cafe has flame burners, music playing and a range of hot drinks that you can order too such as mulled wine (svařák) and hot chocolate. The tower is brightly lit in blue and red above you, quite the setting. Surprisingly, this time my daughter didn’t have to pay entry despite being 140cm tall. So we paid 120czk for my entry and 50czk each for skate hire - 220czk total. I was confused but happy to pay 120czk less than what I was expecting! There is only one iceskating trainer (dětský trenažér bruslení) for kids to use. It’s a metal bar that looks like a pensioners zimmer frame. Kids can push it in front of them and it keeps them stable. On the Saturday morning when we went there were many little kids learning to skate so we didn’t get to try it out which was a shame as my son could have really benefited giving him the confidence that he needed. My daughter has been quite determined to master the skates and took off immediately, she quickly managed to get around on her own without too many spills. Apparently 2 solid hours of practice will help most kids master stability and have them gliding confidently rather than heavy stepping which is what they seem to do when first starting. Anyway, in the end my son wasn’t so impressed and my daughter was won over so I’ve agreed to take her regularly to practice some more. As for me, it was like riding a bike, one wobbly circuit and I was back to where I’d started, back last century! Some tips: for beginners it’s best to dress in weather proof pants, jackets and gloves - this will keep kids dry and give them extra padding when they hit the ice. I’d also recommend a helmet so that they are protected from nasty falls. Make sure you know your children’s shoe size before you go hire the skates - this will save time trying on different sizes. Take a water bottle for the kids, the get hot and thirsty, if you forget, no problem, you can order water at the cafe for 35czk. Bring money for hot chocolate - to motivate my son into not giving up I bribed him with hot chocolate! DIRECTIONS: By Metro: Take the green line A to Jiřího z Poděbrad, it’s about a 5 minute walk to the tower. By Tram: Take Tram number 11 to Jiřího z Poděbrad or take 5, 9 or 26 to Lipanská tram stop then walk up. By Car: There is some paid parking spots in Ondrickova, Fibichova and underneath the tower.